We are leading manufacturer and supplier of stone carving mosaic tiles. We provide various designs in stone carving mosaic. Stone carving mosaic are available with sandstone, marble, slate stone and granite. 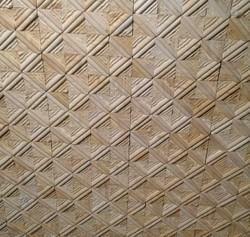 Stone carving mosaic are specially demanded for interior wall cladding. We are leading wholesale supplier of natural stone carving mosaic tiles.This Carving Mosaic Tiles made of Teakwood and mint sandstone with shotblast finish and roses carved on it. It gives very extraordinary looking for any wall you will install it on. Carving mosaic tiles could be use for internal wall cladding as well as external wall cladding for living room, hotels and offices etc. 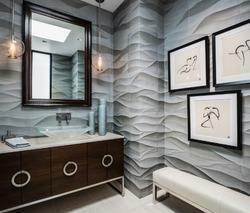 We also provide the installation facility for the Stone 3D Mosaic tiles supplied by us. We are leading manufacturer and wholesale supplier of White Sandstone Carving Mosaic Tiles from Rajasthan, India. These White sandstone carving mosaic tiles crafted on superior quality of spanish beige sandstone with waterjet carving machine. 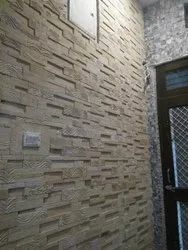 It gives very attractive look on interior as well as exterior wall.We also provide the installation facility for the Stone Carving Mosaic tiles supplied by us. 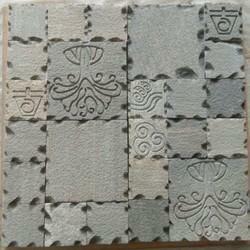 Grey sandstone carving mosaic tiles are made with extraordinary carving work. Kandla Grey Sandstone Carving Mosaic Tiles are easy to install and stunning to see. It is an extremely durable and strength, with lots of texture and relief and a seamless interlocking pattern, you will appreciate the creativity of this hand made product. We also provide the installation facility for the Natural Stone wall cladding tiles supplied by us. • Exterior Sandstone Wall Cladding Tiles, Interior Wall cladding Tile, Lawn Sandstone Wall Stacking Tiles, External Sandstone Wall Panels, Modern Wall Tiles, Stairs Wall Cladding. We are leading manufacturer and supplier of the Sandstone Carving Mosaic Tiles from Rajasthan,India. 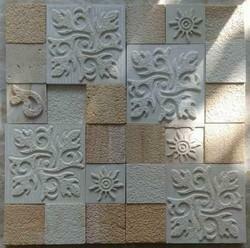 We provide sandstone carvings mosaic tiles with various finishes and designs. This is kandla Grey Sandstone with waves carvings.We also provide the installation facility for the Stone Carving Mosaic tiles supplied by us. We are leading manufacturer and supplier of Yellow Stone Carving Mosaic Tiles from Rajasthan, India. We offers these yellow stone carving mosaic tiles at wholesale prices for bulk quantity. Carving stone mosaic tiles manufactured by us are highly demanded by architects and builders for their interior as well as exterior wall applications. These yellow stone carving mosaic tiles could be use for external and Internal wall cladding. We also provide the installation facility for the Stone Carving Mosaic tiles supplied by us. 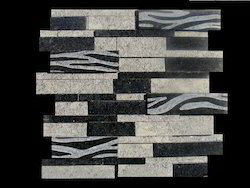 We are leading manufacturer and supplier of Black Stone Carving Mosaic Tiles from Rajasthan, India. We offers best quality stone carving mosaic tiles crafted with using high end quality imported machineries. 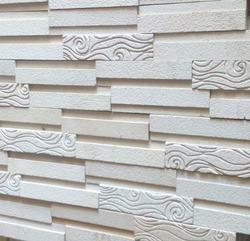 These stone carving mosaic tiles could be use for interior as well as exterior wall cladding. We also provide the installation facility for the Stone Carving Mosaic tiles supplied by us. 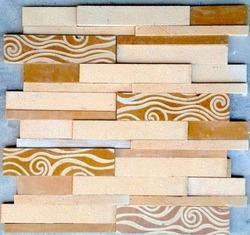 Stone Carving Mosaic Tiles made of superior quality Teakwood sandstone. Our expertise team are working for production of carvings mosaic since last 5 years and gained the perfection in crafting the superior quality carving mosaics. 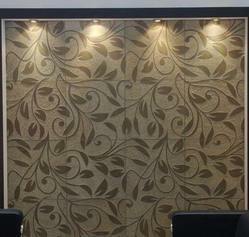 We offer various designs in carvings for internal and external wall cladding. We also provide the installation facility for the Stone Carving Mosaic tiles supplied by us. We are leading manufacturer and supplier of Natural Stone CNC Carving Mosaic Tiles. We are offering these mosaics at very competitive prices with different patterns. These cnc carving natural stone mosaic tiles are best option for interior wall to give extra ordinary look. These natural stone cnc carving mosaic tiles are highly demanded by architects and interior designers for interior wall cladding. We also provide the installation facility for natural stone mosaic tiles supplied buly us.